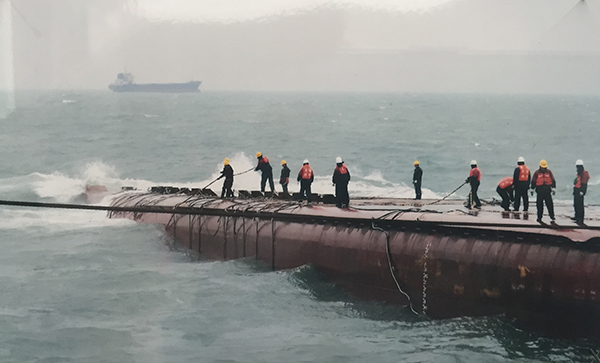 An epiphany on board a junk boat floating between the city of Hong Kong and Kowloon Bay, inspired the latest in the Mr Loadlink blog series. I also took the train during a busy month in Asia. 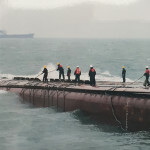 I have been working hard with our PR professionals recently to formulate a content marketing strategy where everyone at Straightpoint is mindful of the story behind their role at the company. 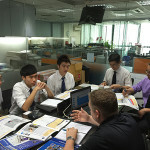 For example, when our marketing team execute the successful launch of a catalogue, a sales person oversees the use of our load cells on a particularly demanding oil and gas application, or a distributor enjoys a fruitful trade show, I encourage them to retain the details so we can generate content to communicate that positivity to the market. While there is a requirement to produce hard-hitting advertisements and product-focussed literature, that largely rely on initial impact, generating positive energy and interest around the brand and our products in other ways sometimes requires a longer term strategy. 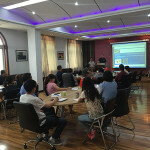 Implementing a successful content marketing strategy requires everyone at the company, particularly those at the coalface, to always be aware of the potential to communicate their activity in a way that could educate, entertain or inform our target audiences and promote our company beyond that which is possible by our advertisements, catalogues and web pages alone. 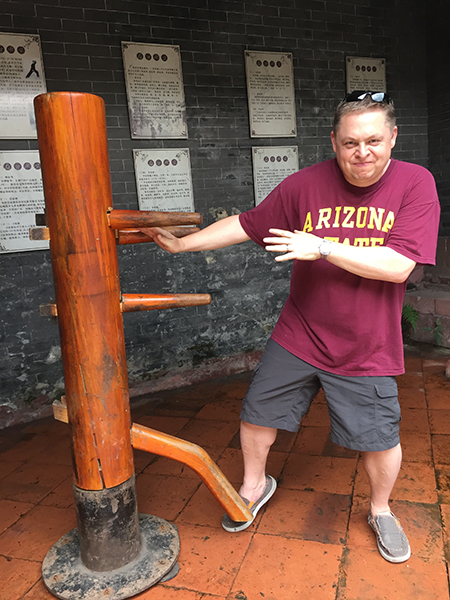 As with any cultural development at the company, I have to lead from the front. 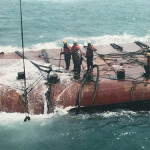 That’s why an epiphany I experienced on board a junk cruise in Hong Kong earlier this month, overlooking my favourite skyline in the world, will live long in the memory. 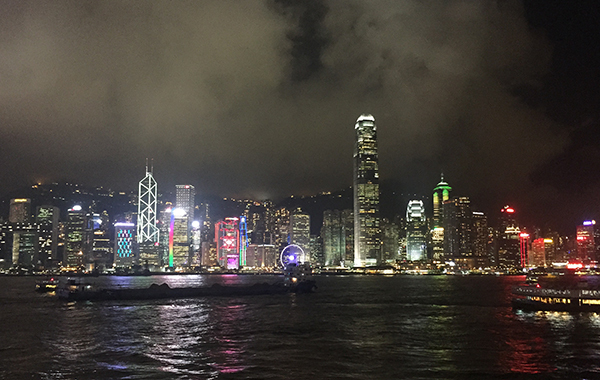 I’m proud of the fact that I thought of you, my readers, when I gazed upon the hulking skyscrapers of Hong Kong during a spectacular sunset. 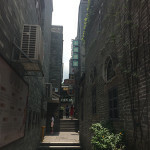 I also thought back to when I had first seen the same view. It was about eight years ago and I’d been to the Hong Kong Grand National with some friends at the Happy Valley Racecourse. I have been in awe of that skyline ever since and think about it often. 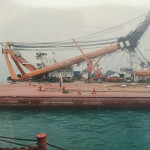 Very little of it has visibly changed over recent years, which is in stark contrast to our business. Little could have prepared me for the growth we have enjoyed and rarely is that put in the context it was by one of the most iconic urban views in the world. 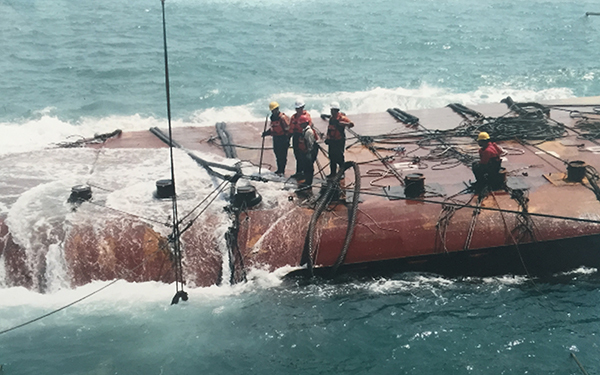 Hong Kong was just one piece of the jigsaw puzzle. 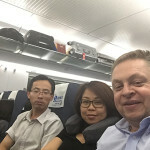 At the start of the month I left the UK and flew into Beijing to meet Xiao Tong Yang and Eric Yang at General Lifting Engineering (GLE) SKIP Lifting, based in Zhangjiakou City, Hebei Province. 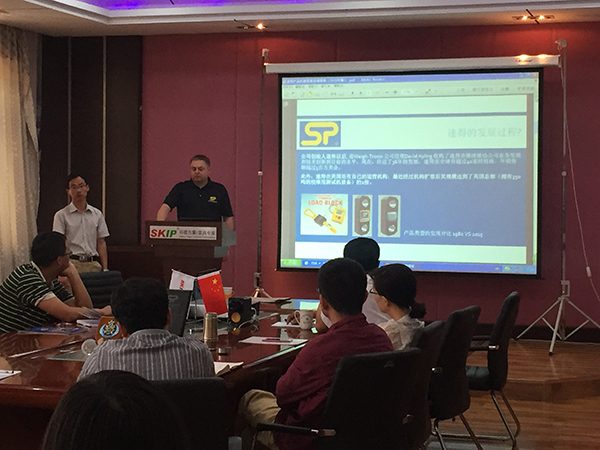 They are our distributor in China so it was great to spend some time in the head office. 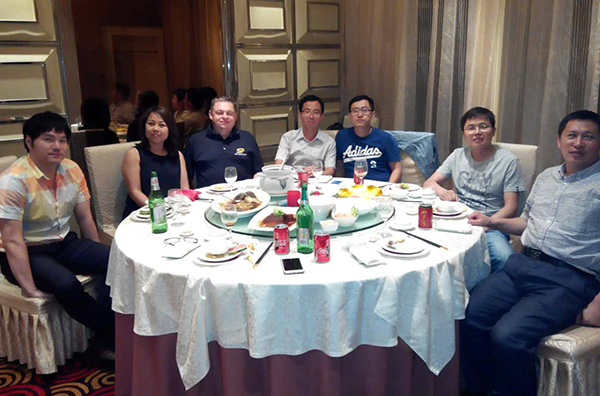 A well-earned dinner with General Lifting Engineering (GLE) SKIP Lifting in Hebei Province. 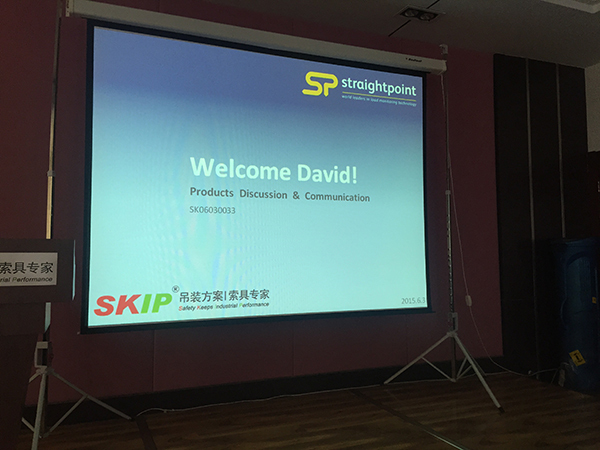 I enjoyed a tour of their new facilities and then led a group training workshop with over 20 of their sales and technical teams. I always enjoy working with people to whom English is a second language. 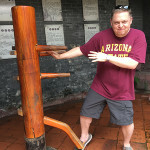 I relish the challenge of getting my message across through a translator as it requires me to be concise and accurate in my delivery of content, which fits an overarching theme alluded to earlier. 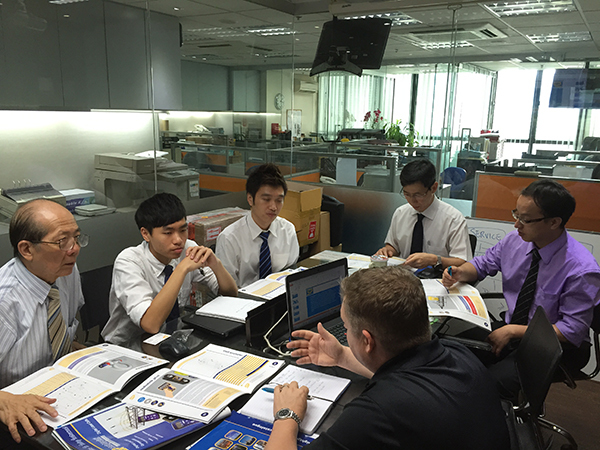 The session proved the importance of etiquette, especially when working in Asian markets where, typically, you have the honour of working with very engaging, personable people who show courtesy in receipt and delivery of items and messages. I always respect the way professionals in the region exchange business cards with a very deliberate two-handed gesture whilst making eye contact. Sometimes at home, people are guilty of handing over their details without such sincerity. 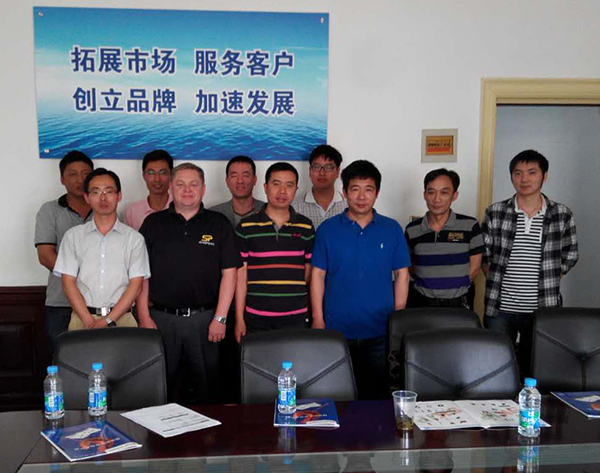 Even though building a long-term relationship might not have been my objective, I felt that making eye contact with the translator, who directed proceedings during the Zhangjiakou training sessions, made him feel respected which was important to the efficiency of proceedings. 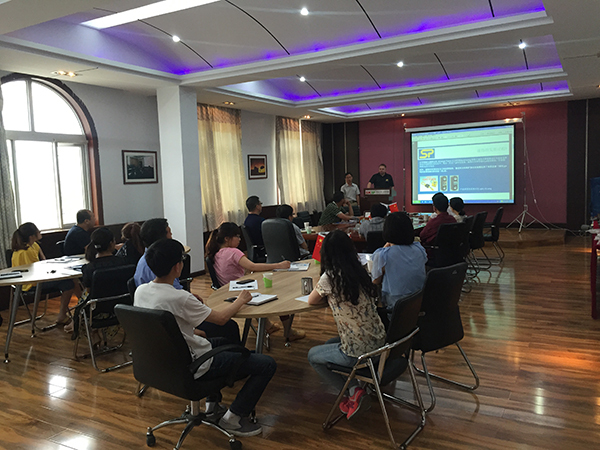 In turn, I averted my gaze from the translator to the group as he delivered my message. 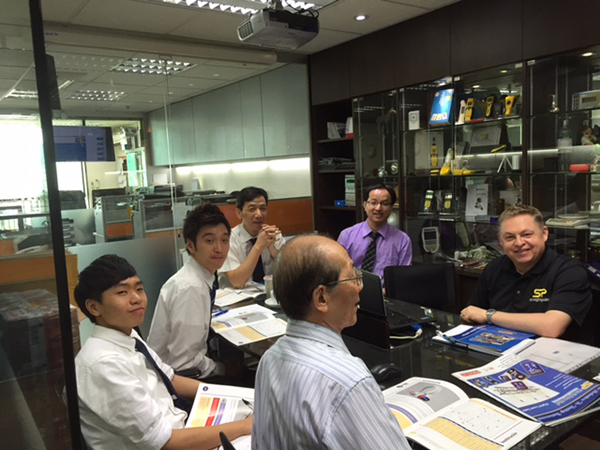 It is of paramount importance that people doing business in Asia travel to build partnerships. 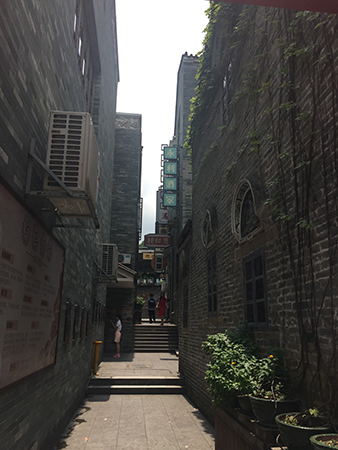 It is a long way from the UK but so much can be achieved face-to-face, which is true the world over but particularly of a place where relationships are nurtured and treasured. 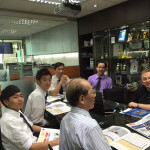 I have made lifelong friends here in Asia for that reason. 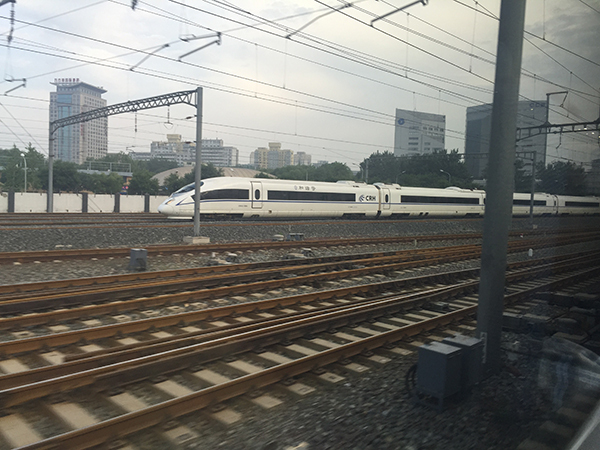 It was a feature of this business trip that much of the mileage we covered in China was by train. 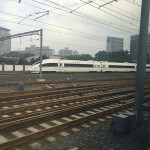 I travelled from Beijing on the Beijing-Guangzhou High Speed Railway, for example, which travels in excess of 300kph and is more commonly referred to as the ‘Bullet Train’. The scale of the infrastructure project required to move people around at this speed impressed me. The stations were far larger than I have experienced elsewhere in the world. 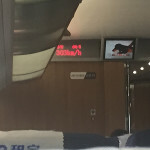 Reaching 300kph on the Bullet Train! 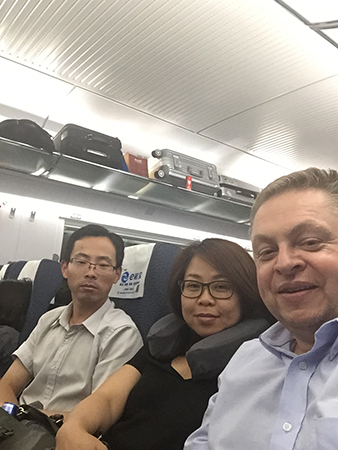 Eric, from General Lifting Engineering (GLE) SKIP Lifting; my wife, Kannika; and I on the Bullet Train to Shanghai. Having referenced the personable side to doing business in the region, it was fitting that we journeyed by rail. 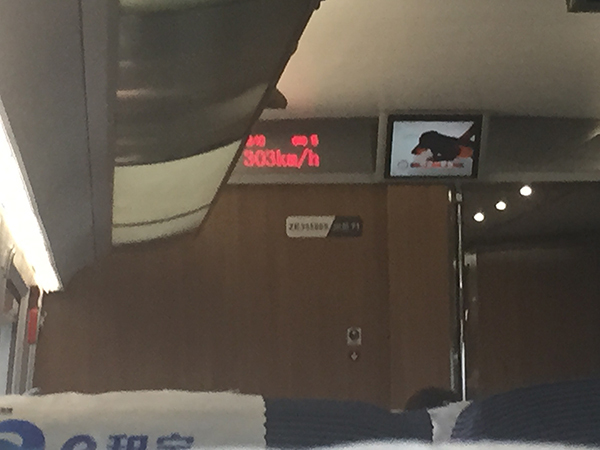 Travelling at such colossal speeds was similar to being on a plane but there is something more civil about train travel. It is a common mode of transport featured on travel programmes, as we’ve all seen, and it’s no coincidence that learning how to say ‘Where is the station?’ and ‘How much is a train ticket?’ are questions that always feature early in foreign language lessons. 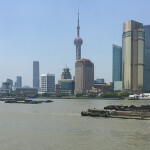 Trains are often an efficient way to travel, whilst submerging yourself in a local culture. Talking of train stations and language lessons, I noted that all the signage at stations was in Chinese. 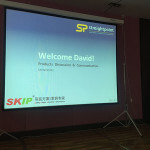 It reminded me of the importance of addressing an audience and providing clarity of information, which is always something I’m mindful of when preparing literature and presentation slides for the Asian market. 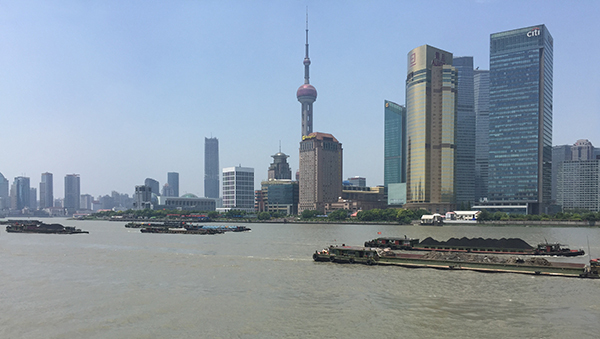 The next stop was Shanghai, where we visited the Shanghai Salvage Bureau with GLE to present our new catalogue. 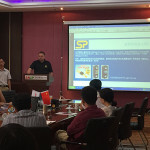 They already use many Straightpoint Radiolink Plus load cells and it was rewarding to reinforce their knowledge of our equipment with a training session with their local sales team. 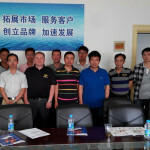 It was great to present our new catalogue to the Shanghai Salvage Bureau with GLE. 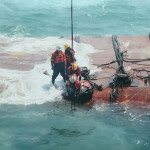 They have some fascinating pictures of their work on the office wall of a Towage & Salvage operation. 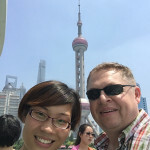 Later that week I met with a very good friend of mine, Julie Zhu, who is CEO of Kyloweigh Inc. She took me on another river trip on the Shanghai Bund. There was no match for the awe inspiring Hong Kong skyline of earlier in the trip but the voyage incorporated a visit to a brewery where I tried one of the best beers I have ever tasted, so I settled for that! 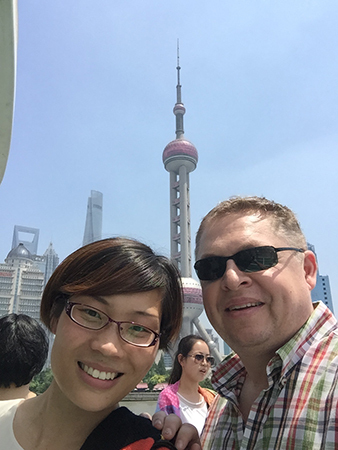 My good friend Julie Zhu, CEO of Kyloweigh Inc, took me on a fabulous river trip on the Shanghai Bund. 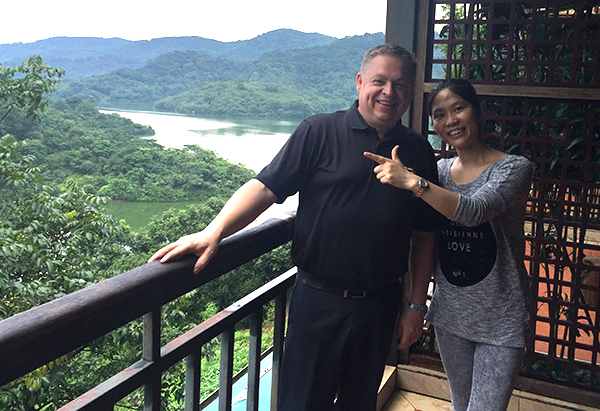 Candy Lee, of Jian Feng, took me to an old town near Guangzhou where I tried Kung Fu. The trainer said I had much potential with a low centre of gravity and quick hand speed. 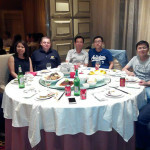 Jian Feng were my next appointment where Candy Lee was my host as we looked at their latest products. They had a range of shackles and slings in stock and it was enjoyable to spend time with Candy and get to touch and feel the equipment. My standout memory will be the spotlessly clean factory and superb layout. 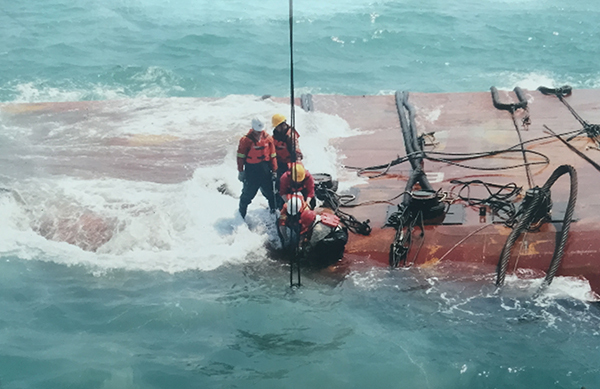 We try to be as efficient and clean as possible at Havant headquarters but there are always lessons to be learnt from visiting other facilities. 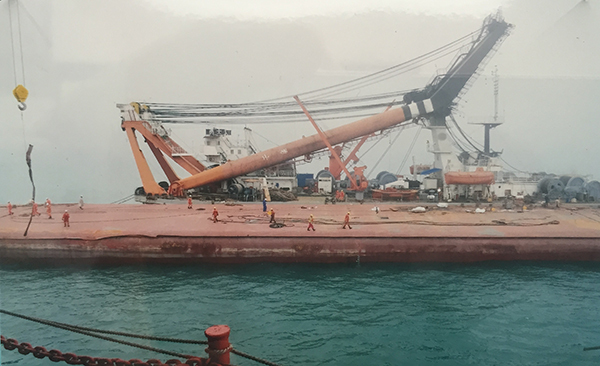 So many companies and fantastic lifting professionals featured in my notes this month and I can’t name them all, but I want to highlight one more—Promat (HK) Ltd, who showed great interest in our new catalogue and extended typically warm and friendly Asian hospitality. 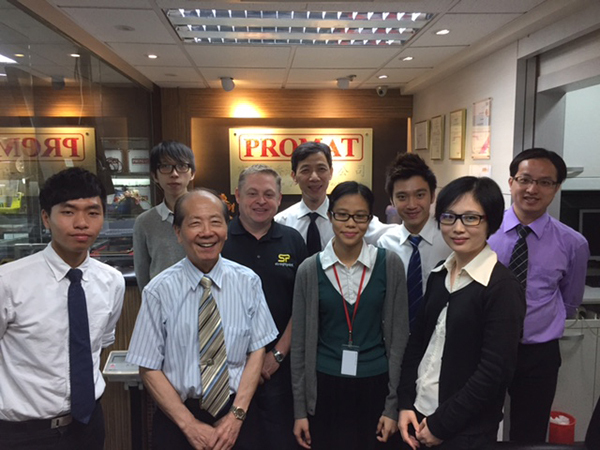 It was great to catch up with the team at Promat (HK) Ltd. 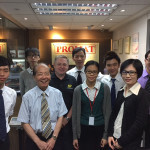 Team photo at Promat (HK) Ltd.
My month concluded in Singapore and Sri Lanka, where we exhibited at the inaugural LEEA Lifting & Rigging Conference Asia and then the Premier Industrial Exhibition & Trade Fair (INCO) respectively. More on both next month as I’m conscious this has been a lengthy entry, but it’s worth saying what a great job LEEA did of launching a new conference-exhibition. 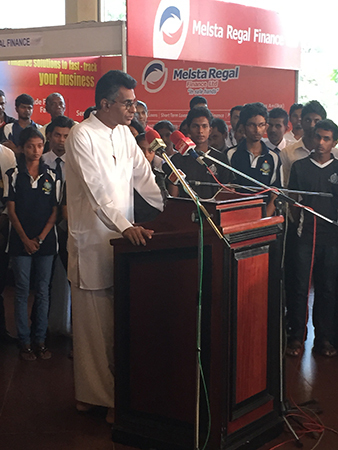 Transport Minister Champika Ranawaka visited our stand at INCO in Sri Lanka. 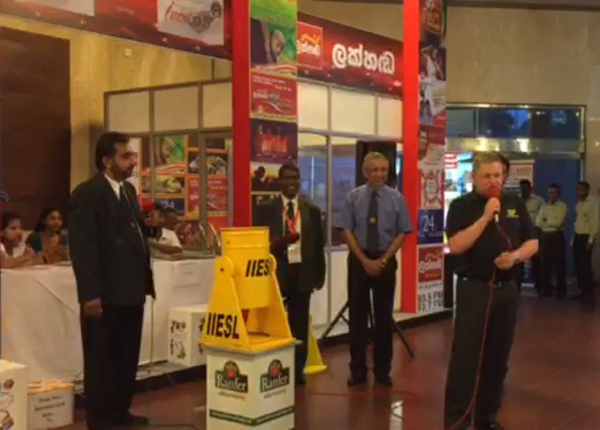 I was invited as a special guest to the opening ceremony of the final day of INCO, which was covered on ITN Sri Lanka TV. 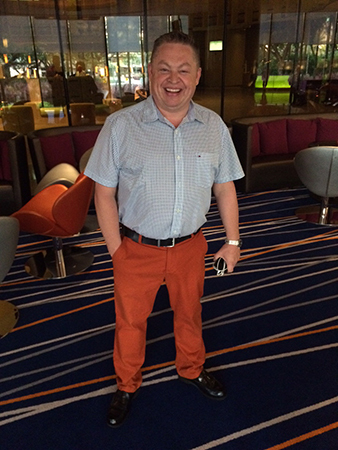 One of the talking points at the inaugural LEEA Lifting & Rigging Conference Asia was my favourite trousers! 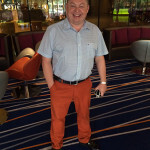 Colour coordinating with the furniture behind! 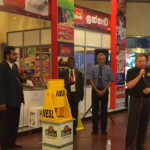 And, by way of a Stop Press, I was invited as a special guest to the opening ceremony of the final day of INCO, which was covered on ITN Sri Lanka TV. 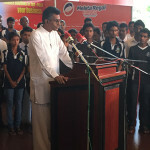 Transport Minister Champika Ranawaka was a special guest and stopped by the Straightpoint stand. What an honour! Heading to Japan next where I’ll catch up with RUD Lifting Japan, who are showing our products at entertainment show Content Tokyo 2015 at Tokyo Big Sight.